Construction began last week on the missing link that will tie together three light-rail lines that serve but do not connect in downtown Los Angeles — the Gold Line, which runs from Pasadena to East Los Angeles via Union Station, and the Blue and Expo lines, both of which currently terminate at the original Blue Line terminus at 7th Street-Metro Center. 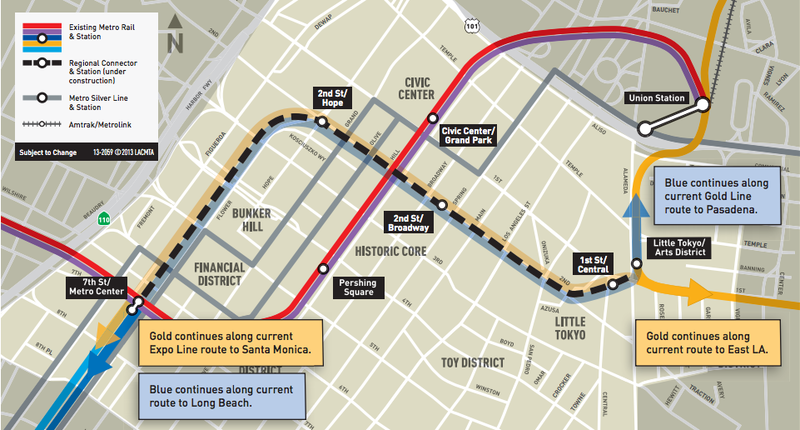 Blue and Expo Line riders can currently use the heavy rail Red and Purple lines to reach Union Station and the Gold Line, but the new Downtown Connector subway will reconfigure the three routes so that all riders will enjoy single-seat rides through downtown. According to a City News Service report in the Orange County Register, U.S. Transportation Secretary Anthony Foxx and Los Angeles Mayor Eric Garcetti spoke at the groundbreaking at the Little Tokyo/Arts District station. Actor George Takei, who is known in L.A. for his transit advocacy (as well as his role as Sulu on Star Trek), served as emcee at the groundbreaking. The 1.9-mile, $1.4-billion subway will have three new stations, one at First Street and Central Avenue, one at Second Street and Broadway, and one at Second and Hope streets. When complete, Blue Line trains will run through it from Long Beach to the Pasadena end of the Gold Line, and Expo Line trains from Culver City will continue along the Gold Line alignment to East LA. Extensions of the current Gold and Expo lines also under construction will expand service from Pasadena to Asuza and from Culver City to Santa Monica. The new subway is expected to open in 2020. Nearly half the funding for the line — $670 million — comes from the Federal Transit Administration, with additional funding coming from Measure R, a half-cent transportation sales tax passed by Los Angeles County voters in 2008. The Turkish-based international transport news site Railly News reports that tunnel excavation is complete for line M5 of the Istanbul metro, the second subway line to serve the part of the city that lies in Anatolia, on the Asian side of the Bosphorus Strait. The line will operate from Üsküdar station eastward to Cekmeköy-Sankcatepe. Riders can transfer at Üsküdar to the Mamaray commuter rail line, the one rail transit line that crosses the Bosphorus to link Istanbul’s European and Asian sides. According to the report, 1,800 construction workers had been digging around the clock to complete the tunnel. Crews are now pouring concrete to line the tunnel and building the line’s 16 stations. The 20-km line is on track to open next year. Although Istanbul is home to the world’s second-oldest underground railway, the 1875-vintage Tünel, and plans for a metro system had been proposed several times since 1912, construction only began on the city’s first metro line in 1989. Both Railway Age and Railway Gazette International reported on the Port Authority’s Sept. 26th RFP. The extension has a projected price tag of $1.5 billion, a figure Railway Age said some critics questioned without stating who the critics were. A Port Authority study recommended the extension in 2012, and the project is part of the agency’s 10-year capital plan adopted last February. The Port Authority plans to start work on the extension in 2018 and finish it in 2023. Even though it will not enter the airport itself, the extension will still make it easier for Lower Manhattan residents to get to Newark Airport by reducing the number of transfers needed. It should also prove more convenient for airport workers and residents who live close to PATH’s routes through Hudson and Essex counties. Know of a project that should be featured in this column? Send a tweet to @MarketStEl with the hashtag #newstarts.